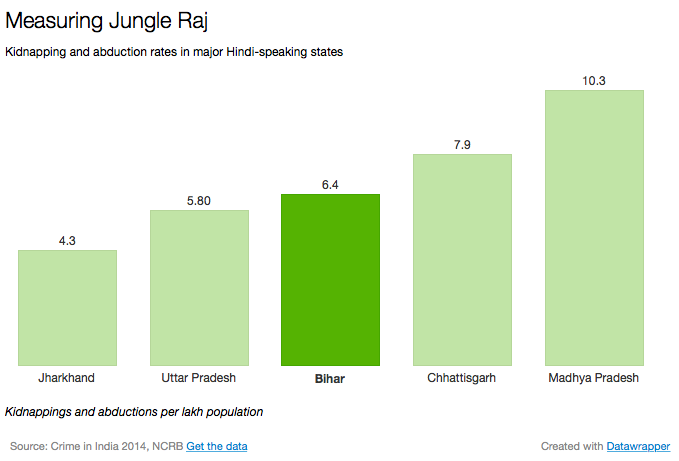 Does Bihar’s kidnapping industry embody “Jungle Raj”? In a fiery election speech in Munger, Bihar, Prime Minister Narendra Modi stated that the coming state election was a choice between “Jungle Raj” and “Vikas Raj”, with the Bharatiya Janata Party (BJP)-led alliance representing the latter. Modi cited widespread kidnappings in Bihar as an indicator of how lawless the state has been under Nitish Kumar’s Janata Dal (United) (JD[U]). Let’s leave aside the obvious objection that the BJP bears some responsibility for this, having run Bihar in coalition with the JD(U) for the past decade. In a heated election campaign, the BJP needs to differentiate itself from Nitish and his newfound ally, Rashtriya Janata Dal (RJD) leader Lalu Prasad Yadav. As you can see, Bihar sits somewhere in the middle while Madhya Pradesh, ruled for 12 years by the BJP, has a kidnapping rate 61% higher than Bihar’s. What about the trend line; does it support the charge of “jungle raj”? It certainly seems that Bihar’s kidnapping rate has jumped between 2007 (2.7 per lakh population) and 2014 (6.4 per lakh population). 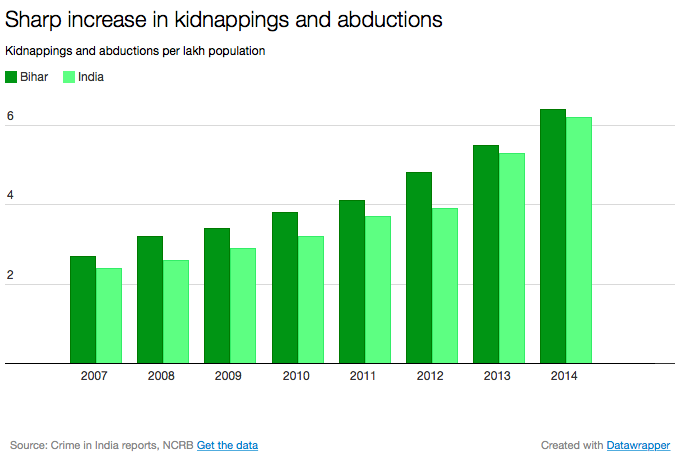 But that’s not the whole story: India’s overall kidnapping rate has actually risen a bit faster in the same period, and Bihar’s share of national kidnappings has in fact dropped from 9.2% (2007) to 8.5% (2014). This may be little consolation for the 3,940 additional Biharis who were kidnapped in 2014 versus 2007, but the chart below is illustrative. What’s not clear is if there has in fact been a national upsurge in kidnappings or whether there are technical or procedural reasons that have raised the numbers. But what is clear is that, while Bihar certainly has law-and-order issues, the state’s performance in this particular area has been only slightly worse than the national average. The charge of “Jungle Raj”, at least so far as kidnappings go, isn’t supported by the data. Does the New York Times really have an India problem? I think the people of Bihar chose the right candidate when they chose Nithish Kumar.